This is a great place to spend your weekend with your kids. There are different sections to go through. The Agos (Flow), Bahura (Reef), Laot (Fishing Ground), Buhay Na Karagatan (Living Ocean), Ang Kalaliman (The Deep) and Pating (Shark). 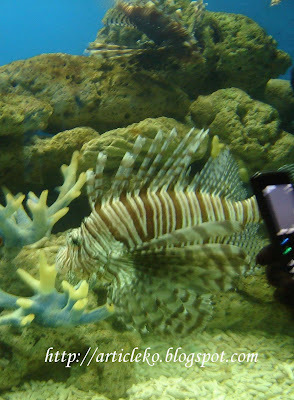 I'm sure your kids will love seeing the colorful fishes in glass tanks, starfish, the spider crab(the largest living arthropod), sharks, stingrays and more. The highlight is a walk through the tunnel that is nice enough but pretty short. How I wish it was longer than it is. Unfortunately, there are no live corals or seaweed, but all the tanks are very clean and the collection of fishes are good. You may enjoy having a fish foot spa where your feet will be nibbled by "doctor fish" which is proved to be therapeutic. You have to pay an extra amout of P120 for it. 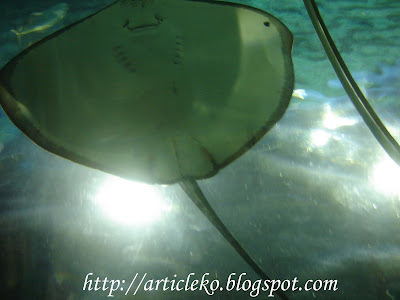 You may also try an experience in a Glass Bottom Boat Ride where you can view the fishes, stingrays and other creatures below it, but it is not that big. The boat guide will made it exciting though. There is also a souvenir shop where you can buy something as a remembrance. MOP is accessible to Intramuros, Rizal Park, floating restaurant and casino and even at the SM Mall of Asia (huge mall in Asia). Although MOP not as great compared to other Ocean Parks in other countries, I am proud that we have this in my homeland, Philippines. Overall very nice place if you are a having a family day out. This zoo is well worth the long drive. There are lots of animals to see and their habitats are pretty spacious and clean. It's so nice to see that almost all the animals look very healthy. The staff here definitely knows how to take good care of their animals. I have been to a lot of zoos but I can say that this is the best so far in my homeland, Philippines. You can hire a tour guide if you want to since the zoo is so huge that you can't finish roaming around the zoo for about 2-3 hours. We got the opportunity to watch the staff member of the zoo training an eagle and a hawk for a wildlifebird show. There are several animals that you can touch guided by the trainor like snakes and birds. There is also a pet store in the zoo so if you want to buy and be inspired by amazing animals come and buy some. 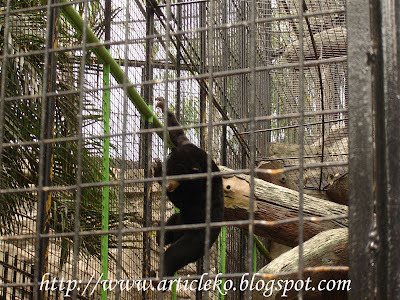 By the way, this zoo is located at San Isidro, Rodriguez, Rizal. Some bird species include talking myna, ostriches, eagles, hawks, cockatoos, canaries, toucans and more are there.There are also leopards, jaguars, lions, pumas, Bengal tigers and more big cats species. Fish species include arapaimas which are so gigantic, pirranhas and more. 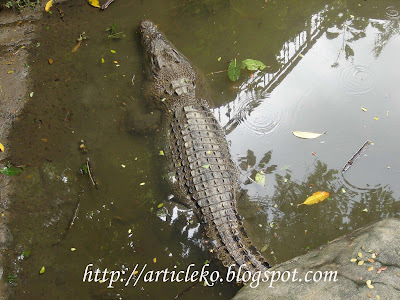 Reptiles and amphibians include alligators, crocodile, snakes, anaconda, turtles and more. There are also kangaroos, tapirs, wallaby, tarsier, sunbears,bear cans and more. 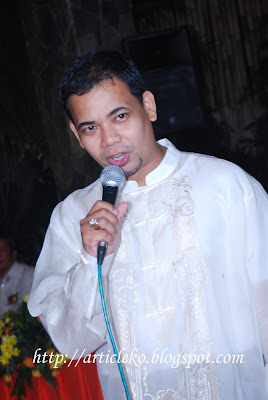 Our professional emcee has an unbelievable golden voice and talent. He used to be a former newscaster, announcer and DJ with experiences in the field of entertainment and ceremonies and has hosted hundreds of events even professional boxing matches. I met him during the grand food tasting held at Gazebo Royale. There were lots of professional emcees to choose from but I chose him because he really has an awesome voice! No wonder all of the guests complemented him for his golden voice and humorous personality. He made the program alive and there were no dull moments! ^_^. I highly recommend you our emcee Mr. Jun Dumlao! After the day of the wedding I received a lot of positive and few negative comments about our suppliers. Although the caterer served delicious foods some of our guests said that the caterer didn't refill the the foods in the salad station which they must do while the program is still going on because we've paid for it for more than 150 guests. One of my sisters also noticed that the caterer didn't refill the salad when she was about to get some more so she asked the caterer to fill it (maybe that was the only time the caterer refilled it...grrr). There were also lots of foods left after the wedding and I don't know why my family and relatives got only a few of the foods packed to take home by the caterer. I'm not sure who's to blame and I just forgot about it. I also didn't like the outcome of our cake. My description to the cake supplier is not the same as the outcome so I texted the cake supplier a few days after the wedding and asked what had happened because I gave them additional payments just to make our cake bigger and nicer. I'm disappointed by their answers but still happy with the overall outcome of my wedding.Thank you to my family, relatives and friends who attended the wedding and to all of our suppliers...and of course to my loving, sweet and supportive honey! I love you soooo much! We had a dove release a few minutes before the professional emcee started the program. The coordinators assisted and cued the processional line-up of the entourage participants (except for the principal sponsors). When everybody was ready to start the program, the emcee gave his welcoming remarks to the guests and introduced my parents, principal sponsors one by one followed by the secondary sponsors as they walk down the aisle on the red carpet. Then he gave a brief background of me and my husband. My dad sang a lovely song (which is my idea) while my hubby and I were having the grand entrance with the bubble machine, sword parade, confetti and rose petals. My dad also led the invocation and instead of praying it the usual way, he sang "The Lord's Prayer" (also my idea heheheh). Btw, my dad is a retired engineer and I am so proud of him because he won a lot of amateur singing contests including their company's singing competition (but eventually became the judge because he usually won the contests) and the "Father's Day Singing Contest" in one of the radio stations held a few few years ago where hundreds of contestants joined and only 5 were chosen to compete in the grand finale held at SM mall where the judges were famous singers..to mention Lani Misalucha. Whew! he won the grand prize!. Anyway, my relatives and family friends said "wala syang kakupas-kupas" after he sang because they hadn't heard him sing for a long time. The guests can't help but give him a round of applause after his invocation hehehe! Then we had photo ops. The St. Peter Music Ministry sang while the guests per table were queued in to go to us (couple) for the group pictorial. (I was a member of St. Peter Music Ministry before and I remembered the times when we sang on televison mass at NBN Channel 4 and performed in PICC. The guests enjoyed the delicious and tasty foods. We had a buffet and served 7 different viands, salads(fruit salad, macaroni, caezar, hundred island etc), chocolates, crepes and other desserts. The crepes are soo yummy and I really like the taste of it especially the ice cream on top. For our Wedding Banquet and Entertainment, the guests enjoyed watching our childhood to adult pictures (flashback- Audio Visual Presentation) which were presented on the wide screen as well as our pictures together with some relatives and of course the nice video message from my parents-in-law. All ears were focused on the video message because it was so touching and nice. While the guests were watching the AVP, our guestbook attendant (bridesmaid) went around for the guest's to sign and give inspirational messages. The bachelors and bachellorettes enjoyed the games a lot. The first one who touched the tossed bouquet will be out and so on. My cousin April was the one who unintentionally didn't touch the tossing bouquet so she's the one who made it to the hot seat. She was blind-folded so she couldn't see which bachelor she's gonna choose. The emcee asked questions to the bachellors that will make my cousin decide who she will choose and put a garter on her. The qualities of a man that my cousin likes matched one of the bachellors and there were some questions asked to my cousin too (it's somewhat like a dating game). While the game is going on, the maid of honor distributed the souvenirs. Next, we had the toast led by the best man kuya Zernan Canonigo(who accompanied me to the wedding expo and had also a beautiful and successful wedding 2 years ago where I am one of their secondary sponsors. Thank you so much kuya zernan and ate luz!) and the cake cutting. I was so shocked that my hubby gave me a big slice of cake not using a fork but using his own fingers... sooo sweeet hehehe! then I also gave him a big slice. hehe.We had a wine toasting again and the guests joined the toast. We also had our first dance surrounded by bubbles from the bubble machine. I danced with my dad and my hubby danced with my mom. Then my hubby and I danced together sweetly. My little niece and her cousin joined us in the dance floor. My sisters, a friend and my parents gave speeches with sweet messages. My hubby and I gave our messages too and the emcee gave his closing remarks. The finale of the program was an awesome Outdoor Fireworks Display courtesy of Dragon Fireworks with pyrocrew and firing permits (the official fireworks of Mall of Asia and World Pyrolympics). Wow! Wow! Wow! Wow! Wow!...that's what the guests uttered while watching the fireworks. The fireworks in person are a lot better than in pictures and video. It is really amazing especially before the fireworks display ended with a very huge bomb of light that popped in the sky, the comet salvo fired in professional angled fan formation and the triple shooter golden crown brocade. The fireworks lasted for a few minutes and I'm so happy with the result. The president of the Dragon Fireworks Mr. Hans Ong (whom I talked to during the Wedding Expo held at PICC) kept his promise that he will add a huge awesome pasabog as finale and yes it was unbelievably amazing!!! All the guests complemented the fireworks display. A big thumbs up to Mr. Ong! We were welcomed by the coordinators and staff of Gazebo Royale as we arrived at the reception and we went straight ahead to the air conditioned VIP room (which is so nice and like a mini hotel room) to rest for a while. But while I was going inside the VIP room, my eyes were drawn to the over-all reception set up (guest's table, couple's table, VIP table, wide screen, buffet set up, crepe station, cake set up, and salad bar station set up). They were so nice and attractive. After a few minutes, my hubby and I had pictorial around the reception while the guests started to arrive. The coordinators ushered the VIP and guests to their respective seats and the caterer served soups, assorted cocktail french bread canape' and assorted cocktail cold cuts as appetizers to ease their hunger pangs before the program started. We arrived at the church so early, a few hours before the wedding ceremony, so the coordinators advised me just to stay inside the bridal car. It was a good thing that the air conditioner was always on and while waiting, the driver of the bridal car talked with me to ease my boredom, asked about my love life, family and eventually turned our small talk to the extra charge for the bridal car because we might exceed the maximum hours of the rental hehehe. I already knew about it beforehand because I had computed the maximum hours we will consume for the bridal car rental. Anyway, the coordinators liased with the church in charge and checked the ceremony venue set-up, ensured that the ceremony related supplies were delivered, distributed the missalettes, briefed church participants in their duties and seat assignment, distributed flowers and ceremony materials to the entourage, and assisted and cued processional line up. At 4PM the ceremony started. 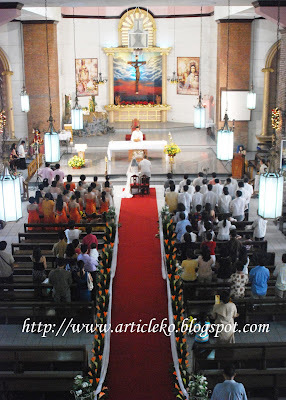 While the huge main door of the church was opened for my grand entrance, all the people's eyes were focused on me. I had mixed emotions... I felt happy, excited and a bit nervous. 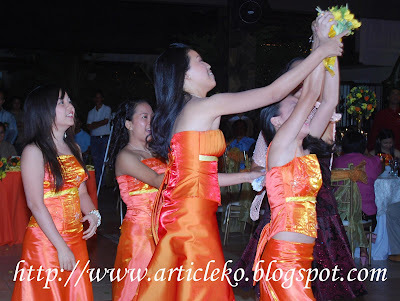 My schoolmate (in gradeschool) sang while I was walking down the aisle. Her song really touched my heart as well as the guests' and that made it dramatic and added beauty to my wedding. I can't believe the whole time during the ceremony that I'll be married to the man I am dreaming of, who I know will take care of me, will not hurt me emotionally and physically and will love me till the end. The wedding ceremony went smoothly. The choir members had such very nice voices. The lectors and commentators did their jobs well (LECTOR:my cousin Atty. Catherine Canonigo-Gan, COMMENTATORS: my mom, family friends-Mrs. Fullente and Ms. Mylene Orillo), while the offerors are the members of the entourage. The ceremony ended and I'm so happy and blessed to have such a wonderful husband like him. The coordinators assisted the entourage for our grand welcome outside the church. We felt so overwhelmed by the warm welcome with thrown rose petals and confetti poppers. My family, relatives and friends congratulated us. Our Wedding is such a Wedding Rush!!! So stressful because we only had limited time to prepare for it. Even the night before the wedding, I was still busy preparing for our wedding and I was still checking if all my ideas in the programs and everything that I wanted to happen on my wedding day were all relayed to our coordinators, professional emcee and other suppliers. And oh! I forgot to include the Unity Candle Ceremony in our missalette! I just noticed it while my hubby and I were practicing our lines! So I researched on the internet and just inserted some lines in the missalette and texted my cousin about it who was assigned as the lector in our wedding ceremony. I then informed the coordinators to relay it to the priest as soon as they arrive in the church and re-checked all of my wedding stuff to see if there was still anything missing and because of that I went to bed so late (around 1:30am) and woke up at 5:30am. At 7am my family, some members of the entourage, the driver and the make-up artists arrived. We took our breakfast but I didn't eat that much because I dont want to p _ _ _ on my wedding day (you know what i mean hehehe!) My make-up artist started his job at 9:30am while the other make-up artist whom I hired for my mom, sister and some members of the entourage who arrived at the hotel did his job too. We followed the Bride's and Groom's Time Schedule set by our coordinators. After a few hours the wedding coordinators arrived and checked if all the things needed for the wedding were complete. They checked the flowers for the entourage to see if they matched the contract, collected all the items needed for the wedding, re-checked the program that I made for the reception and arranged the last minute details. A few minutes later, our official photographers arrived. There were 2 photographers, 2 videographers, 2 lightsmen and 1 assistant. The make-up artist finished my hair and make-up retouch then we started the pictorial where I wore an orange gown instead of the usual robe. Then our coordinators assisted me in wearing my wedding gown...Oops in this moment the cameramen and the videographers were asked to leave the bedroom until I'm dressed hehehe. When we're done the photographers were asked to come inside the bedroom and continued the pictorial. The coordinators put on my veil, sprayed me with perfume, checked the jewelry that I wore and continued the pictorial with the members of the family. Before we left the room, my family, relatives, drivers, coordinators, photographer and videographers ate their lunch in the hotel that we bought for them for free. I didn't want to eat a heavy lunch but my mom and the coordinators insisted. But I just ate a sandwich. We continued our pictorial at the lobby of the hotel. The foreigners who were at the Shangri-la took a lot of pictures too while I am posing at the stairs (whew!). The coordinators ensured that the bridal car will be ready by its call time and that I will leave the hotel on time. 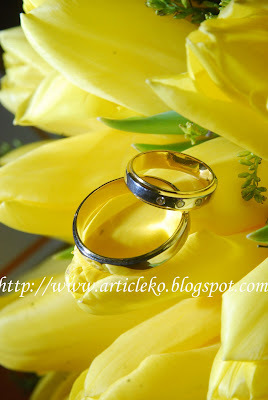 My hubby and I went to the church separately because he has a belief that the groom must not see the bride wearing the wedding gown until she is walking down the aisle. I respected his belief and we followed it. WHAT TO EXPECT ON WEDDING EXPO? Wedding Expo held in PICC showcases the newest styles and the latest trends of celebrating the wedding. The expo is more than twice the size of other wedding fairs. Special freebies in a loot bag and other give aways (i.e. wedding song cd) were given away to the attendees. More than hundreds (around 300 or more) of the country's top caliber suppliers who are among the most talented, most creative and cream of the crop participated in this spectacular event. Tour yourselves and make your eyes busy seeing all of the gorgeous displays of the suppliers. Beautiful cakes and desserts can be seen and they even give free taste tests so the guests can choose which flavor they want to have for their wedding cake. Enjoy the free trial sessions of hair & make up. The make up artists will really make you look gorgeous on your wedding day. Fireworks suppliers show their awesome pyrotechnic fireworks displays on a big screen. You will be amazed by the gorgeous wedding gown displays and couture made by artistic fashion designers. Most of the brides today prefer a "nice twist" to their dresses, so if you want to get ideas don't miss this wonderful event. 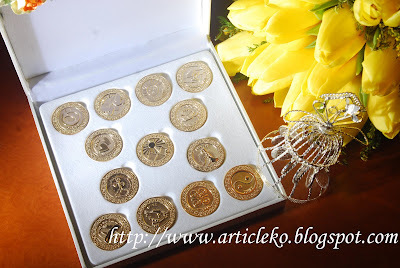 There are hundreds of unique wedding invitations that you can choose from. If you want your wedding to become well organized from preparation until the wedding reception you can hire wedding planners and coordinators. There are food caterers having their grand food tasting or giving free food samplings. You may get so full after tasting the foods from different caterers. Photo exhibits by the cream of the crop photographers who can make your precious moment memorable are there to talk with you and offer their great deal of packages. The country's leading florists can make your church and wedding reception attractive. If you want a perfect atmosphere for your wedding based on your theme or concept which includes decor, lighting effects, color special effects, music to set the mood etc., you can hire an event stylist. Choose your wedding bands in bridal jewelry showcase and your bridal car in Limousine/bridal car showcase that are parked outside the PICC hall. You can see that all of the suppliers are organized per category. It is very convenient for the soon to be couple to comprehensively see their choices side by side and decide which supplier they want for their wedding. For those who can make the on-site booking, you may enjoy the incentives, promos, special offers, great discounts, add-ons, freebies and you will have the chance to win a free honeymoon trip for two! Isn't that great? So don't forget to bring some cash with you for your reservation fees or down payments, who knows you might win a free honeymoon trip from on-site booking! They are also giving away great items for their hourly raffle draw prizes! We actually won one big elegant portrait frame on the event but they are giving out a lot of huge prizes like P250,000 worth complete wedding banquet package for 200 persons plus wedding essential from a catering supplier. Or win a honeymoon stay in a hotel or a pair of wedding rings and a lot more! See? Who knows, you might be the next grand winner and save a lot of money for your wedding by just spending a day in the event! Even if you will not win the grand prize, you still have the chance to win other prizes. For those soon to be couples you shouldn't miss this grandest and most prestigious wedding expo in the Philippines. Soon-to-weds may enter for free, whether they pre-register or not, although it's strongly advised that they pre-register so they don't need to queue during the event. Non-registrant guests pay a P50.00 entrance fee. Guests, family, and friends ofsoon-to-weds may get free entrance for so long as they pre-register. Otherwise, non-registrants (who are also not soon-to-weds) will have to pay the entrance fee. Attending expos and bridal fairs really helped me a lot because I got a lot of ideas and booked good suppliers that saved my time because I'm so busy with my work and fixing and organizing my wedding at the same time. 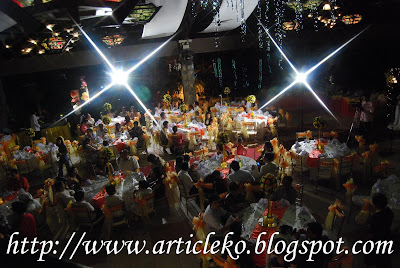 The next wedding expo will be on Sept. 5-6, 2009 from 10am to 8pm at The PICC Forum, CCP Complex. The organizer of this event is the Themes & Motifs-The Special Events Co., Makati Shangri-la Hotel Ayala Ave., Makati City. So for soon-to-wed couples who still want to have their wedding in style whether it be a simple or elegant wedding, I encourage you to attend this grand event so you could get innovative ideas for your special and grandest day of your life! Hi visitors, can we link exchange pls? just click the link above then add your url. I will visit your site soon. Thanks.